The Lightbulb Essence Foundation comes in an elegant 30ml glass bottle equipped with a convenient glass dropper dispenser. When the cap is unscrewed, a little button pops up at the top to allow the product to be drawn up and dispensed in small, controlled droplets. The Lightbulb Sponge (sold separately for $26 CAD) is a foundation sponge designed with one wider, flattened side and one bulbous, slightly pointed side. 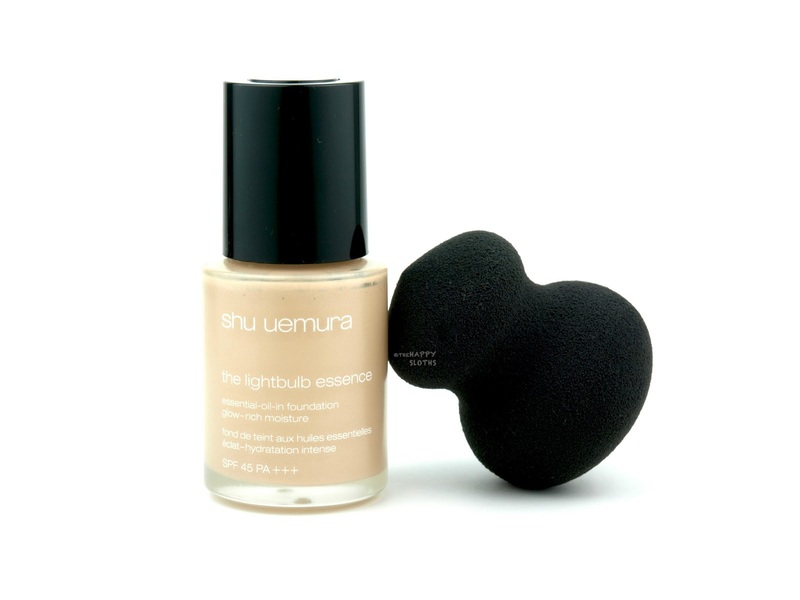 Shu Uemura instructs using the wider side (aka the glow enhancer) to spread the Lightbulb foundation in a tapping motion. The pointed side (glow controller), on the other hand, can be used after application to "soak up" any excess shine, allowing a more customized glow. 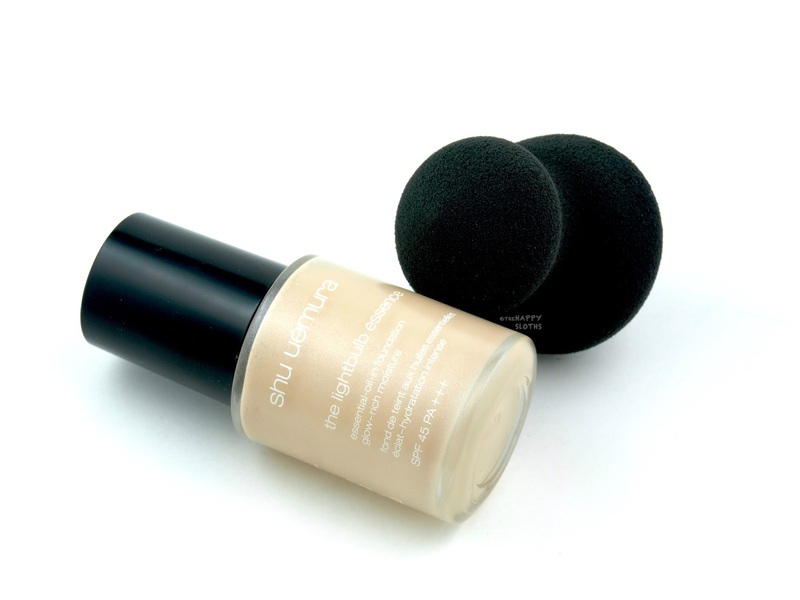 The sponge feels very well made and Shu Uemura claims that it is anti-bacterial. No explicit instructions were given but I presume the sponge can also be used wet. Designed to provide a deeply moisturizing natural coverage (with an impressive SFP coverage of 45), the Shu Uemura Essence Foundation is formulated with five different essential oils (lavender, geranium, ginger, camellia, and rice nuka). So as you can imagine, the formulation is quite runny. The foundation takes on a light essence texture (hence its name) and it is very silky and lightweight. I'm not a fan of beauty sponges in general but in terms of application, this foundation requires a sponge as it would otherwise apply too streaky. The Lightbulb Sponge does a good job at blending the formulation as long as I stick to a tapping motion. The pointed "glow controller" side really does really help absorb any excess shine around the T-zone so there's a lot of control in how glowy the foundation looks. 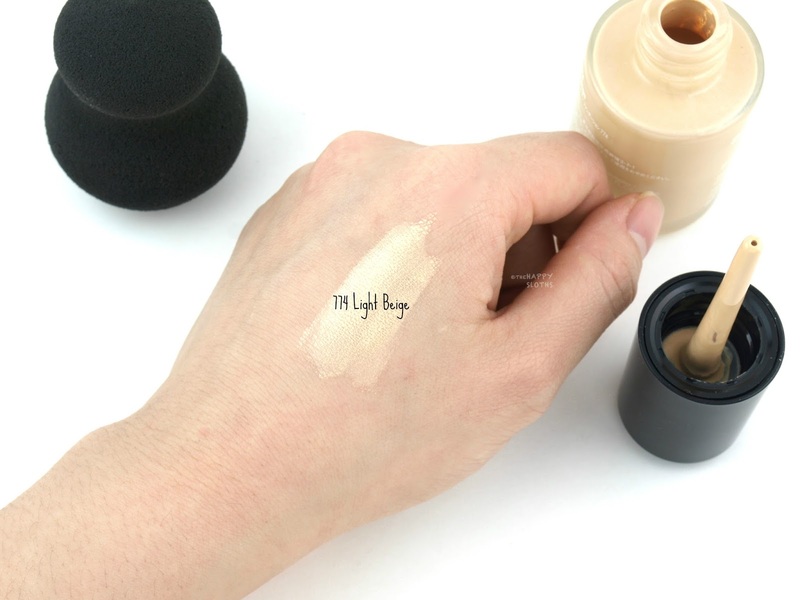 Shu Uemura Lightbulb Essence Foundation in "774 Light Beige"
I have naturally oily skin and although the foundation didn't feel heavy or greasy, it did remain a little "wet". With lots of blotting with the pointed end of the sponge, I was able to get a semi-matte but still radiant finish. 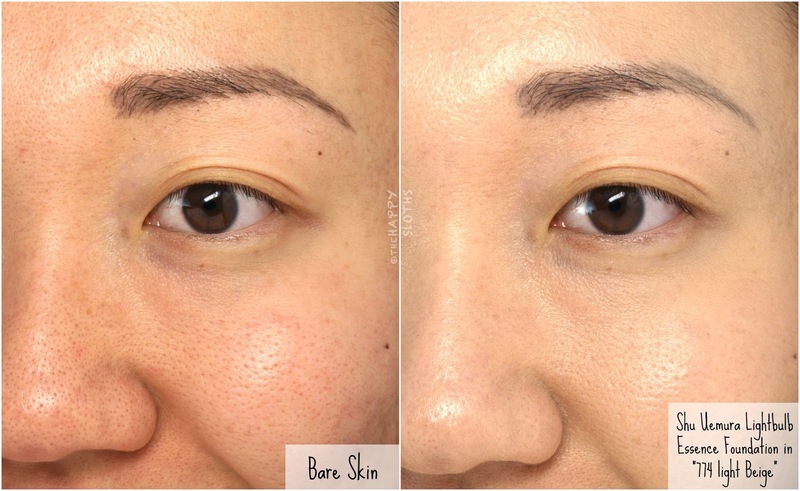 The coverage is very natural and it's not as sheer as I had expected. 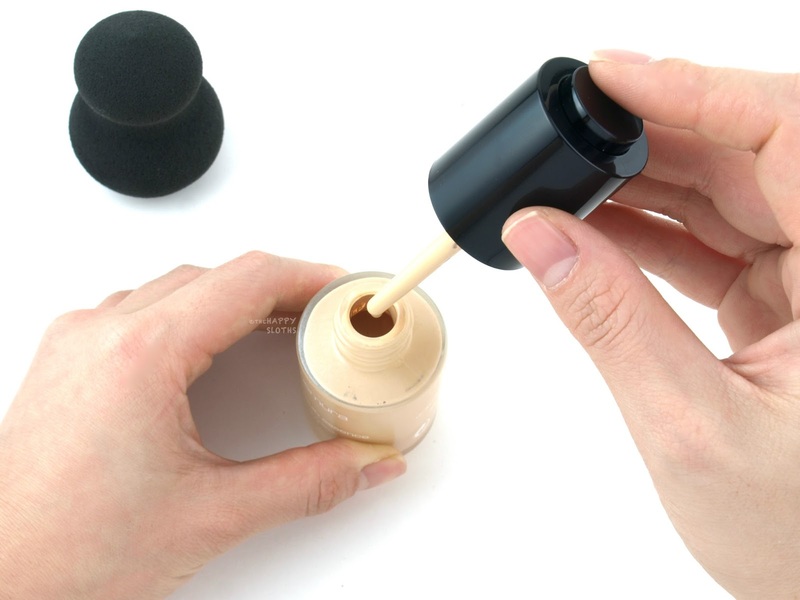 The foundation certainly feels comfortable and nourishing throughout the day but the wear is a little lackluster. Within a couple of hours, my skin looked very shiny. By the end of the day, there was noticeable fading in the T-zone and pigments creased around my nose. "774 Light Beige" is a light neutral ivory. The color swatched a little darker and yellow on the back of my hand but when blended on the face, it became lighter and less warm. There was minimal oxidation throughout the day. Overall, this is a very interesting and unique foundation that's definitely made for dry skin. The oil-based formulation is very silky and nourishing but the wear proved to be too shiny and fade-prone on my already oily skin. If you have dry skin and struggle with foundation caking or clinging to dry patches, definitely give this a try! Shu Uemura is available in stores at The Bay, Nordstrom, Holt Renfrew, select Sephora, and www.shuuemura.ca.